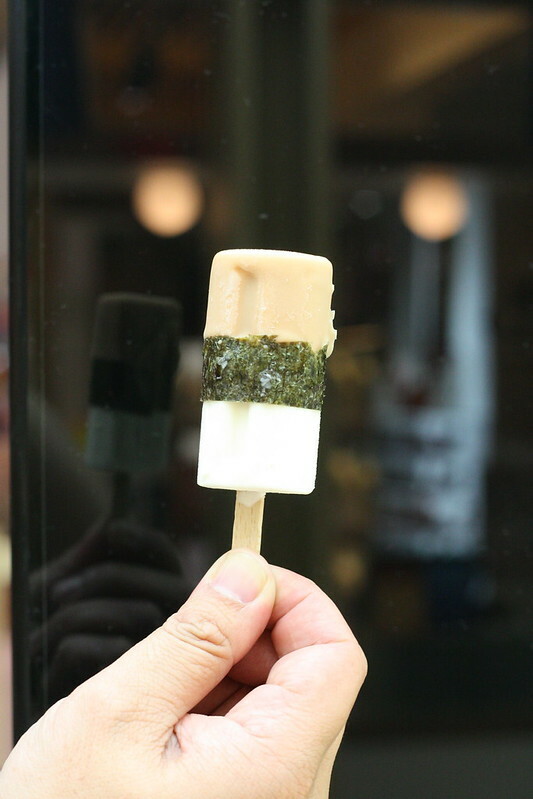 Popsicles never go out in style in our tropical weather and we reckon J.Pop that peddles Japanese themed popsicles will do just brilliantly. The small shop opened next to Arthur’s Mille Crepe along the busy Tokyo Street at Pavilion is the brainchild of the people behind G-Sticks in Ben’s Independent Grocers. Hordes of eager first time customers were crowding the place that it was virtually impossible to get a good shot of their display case. There’s two kinds of sizes, the regular one for RM8.90 and a mini one for RM4.90. I didn’t dare eat much of it since I’ve got a stinker of a cold but I did manage half of the miso mini popsicle. The mini ones have interesting flavours such as wasabi and lavender. The owners of J.Pop have been in the business of churning out gelato for the restaurant industry for some time. I often get my supply of black sesame (goma) and pistachio gelato from them. For the larger sizes, they come in cute shapes too, a heart shape one and even a bear’s paw. Visit them soon as these cool sticks are definitely the next best thing in town. Currently they have this promotion where you keep your receipt and bring it back the next day for a 10% discount. It’s valid for 1 month. Brilliant way to get you licking through their whole collection. For more pictures of the small stall, see Flickr set. You can also check out the latest information with their Facebook page.